Gruppo Meccaniche Luciani has created a six-piece fashion collection built using multi-material 3D printing. Multimaterial 3D printing is opening up a brave new world of fashion possibilities, and the Stratasys Objet500 Connex3 is leading the charge. Gruppo Meccaniche Luciani – a Corridonia, Italy-based manufacturer of moulds and other tools for making footwear – has designed a collection to showcase its new service called rapid prototyping. 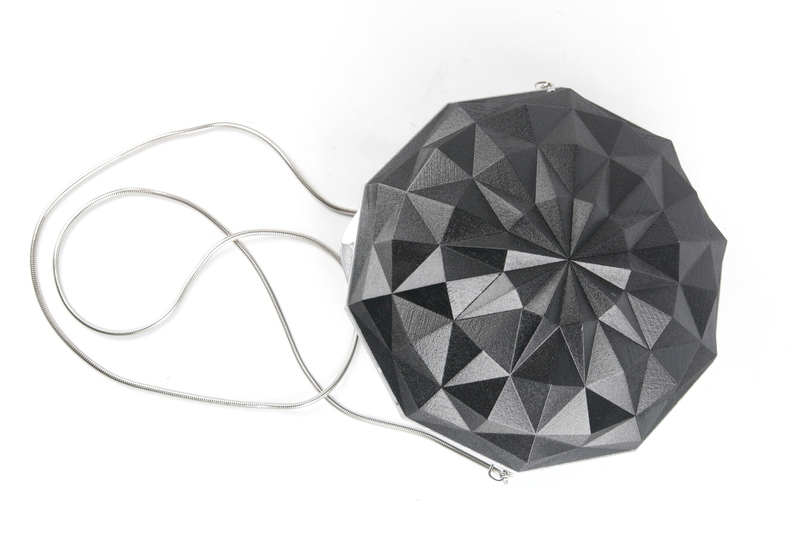 “3D printing enables us to offer a new line of items to our clients. We can design and 3D print realistic prototypes in a matter of hours and incorporate any required design iterations before starting full production,” said Gruppo Meccaniche Luciani’s Elisa Luciani. The collection consists of six items: thee pairs of shoes, a bustier, a bracelet and a rigid, single-material handbag, designed to showcase the intricate work that can be achieved with 3D printing – both with multiple materials, in different colours and textures, achieved with the printer’s triple-jet design; and in the complexity of the designs themselves. The bustier features a cutout in the middle, bordered by black curves contrasted with a pointed prism pattern, and filled with curved lines, in a soft, flexible material – Stratasys’ family of rubber-like materials – that is more comfortable to wear than hard PLA material. “Our main requirement was to produce a highly-detailed, realistic wearable. Using Stratasys’ materials, we were able to 3D print a top with varying levels of softness that could be worn in direct contact with the skin,” Luciani explained. “The ability to combine rigid and soft materials simultaneously is unique and would have otherwise entailed manual manufacture and individual assembly of each material. Meanwhile, one of the pairs of shoes is printed in both rigid and soft materials in two colours for a visually compelling, brightly coloured look; another has a complex, angular latticed design, which fits around the curved shape of the shoe itself. “When designing the shoe we were concerned about the rigidity and resistance of the heels, but the 3D printer’s ability to combine varying densities of rigid and soft material simultaneously enabled us to manufacture the whole shoe in one print,” Luciani said. For many people of varying skin tones, finding the perfect shade of makeup is a near-impossible task. That’s why Grace Choi wants to give people the tools to create a customized line of makeup at home, using 3D printing technology. Choi is the founder of Mink, a desktop 3D printer capable of creating any color of eye shadow, lipstick, lip gloss, and nail polish. Instead of using standard ink, Choi’s product uses FDA-compliant ingredients. Future iterations will be able to process foundations and face powder, too. Not only does Choi’s device make women less reliant on the makeup industry — which consulting and marketing research firm Lucintel estimates will balloon to $265 billion globally by 2017 — it could potentially solve the problem many women of color face. Most off-the-shelf makeup is made with Caucasian faces in mind. As Rebecca Pahle ofThe Mary Sue pointed out, letting women choose the specific shades they find appealing will help limit the power the makeup industry has in defining which tones are considered attractive. This is important. As The Daily Beast reported, most major cosmetic brands have never featured an Asian model, except for Estee Lauder, which worked with Liu Wen in 2010. Letting women create their own colors gives them the power to say what they think beauty looks like. That’s not to mention that if Choi’s product succeeds, it will make her one of the few female faces in the booming 3-D printing industry, which made $3.1 billion last year, according to a report by Wohlers Associates. Choi said during her TechCrunch Disrupt presentation in May, where she first presented Mink, that she was inspired to create the device after becoming frustrated with the meager selection of mass-produced colors at drug stores, and having to go to expensive high-end stores like Sephora to buy specific shades that suited her. She wanted to give the power of selection to women instead of high-end corporations. So how does it work? You simply snap a picture or take a screenshot of the hue you want and figure out its hex code by using a color picker. Then, using a photo-editing program, you enter the hex code in a new document, which will create a square of whatever color you want. Finally, you print the color out the same way you would print a document. However, instead of watching the printer spit out lines of text on a piece of paper, the 3D printer builds powder or cream in the shade you selected inside a special Mink container. The device, which is expected to go to market later this year, will retail for around $300, while ink, substrates, and customized cases will be purchased separately. Considering that Mint.com reports that the average woman spends $15,000 on makeup during her lifetime, $300 seems like a bargain.